This self propelling shower commode provides great functionality for someone with limited mobility and where showering and toileting is difficult. In its design, offering a mobile shower chair, over toilet and commode chair all-in- one solution. Offering large wheels for the user to independently self propel makes this shower commode an ideal solution for personal use. Features include: Wheels are flush with the top of the seat allowing unrestricted access with side transfers, swing up arms and swing away footplates. 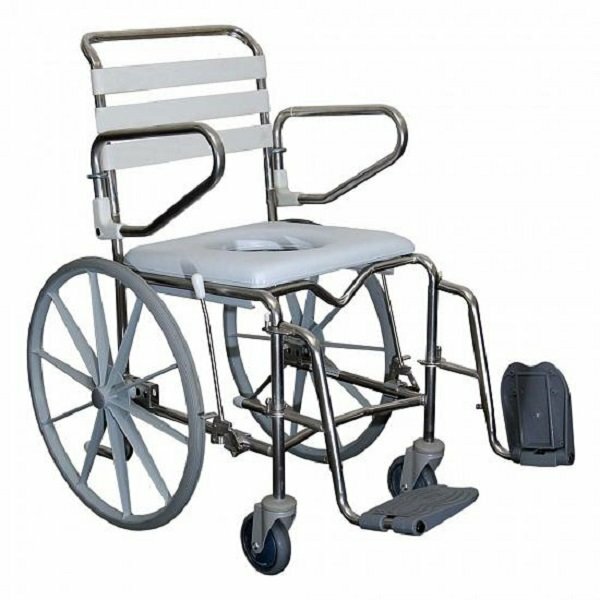 Manufactured from long lasting durable, stainless steel tube, Reinforced nylon waterproof rear self propelling wheels, flexible impervious PVC backrest, water resistant castors with 2 front lockable castors. Can be supplied as a fixed frame or folding option. INCLUDES OPEN or CLOSED FRONT Standard blue seat. Specifications: Seat height 59cm, Seat width 44.5cm, Overall height 100cm, Overall width 51cm and Back height 36.5cm and a Safe working load of 160kgs.